Josh Arksey took six wickets in the match for Cambs against Lincs in Cleethorpes. Cambridgeshire were well beaten in their Unicorns Championship match against Lincolnshire in Cleethorpes. Cambs’ top order collapsed today (July 10) after being set a victory target of 356. 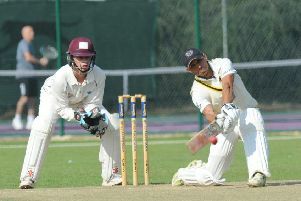 They fell to 78-5 before recovering to 239 all-out with number nine James Vendepeer striking 79. The 116-run win wasn’t quite enough to take Lincs above Cambs in the Eastern Division table. Both are mid-table after recording a win and a loss in two completed games. Scores: Lincs 442-7 (J. Kendall 142, B. Shafayat 101no, L. Kimber 82, C. Wilson 39, C. Jones 32, J. Arksey 3-107) & 268-8 (D. Freeman 85, C. Jones 50, B. Shafayat 45, J. Kendall 26, J. Kimber 22no, N. Keast 22, J. Arksey 3-77, J. Vandepeer 2-83). Cambs 355-9 (A. Woolliscroft 104, J. Seabrook 78, M. Gouldstone 45, J. Vandepeer 42, J. Bowers 25, C. Guest 20, N. Keast 6-137) & 239 (J. Vandepeer 76, C. Beech 44, R. Gordon 40, N. Keast 4-91, C. Free 3-37, D. Freeman 2-18).